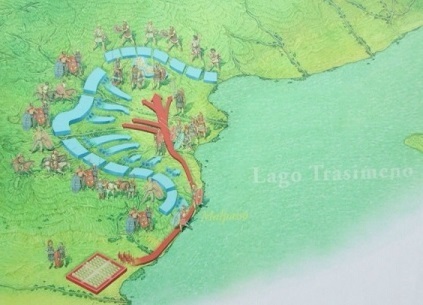 Battle of Lake Trasimene (217 B.C.) - Lake Trasimene was the battle that followed Trebia during the Second Punic War. It was fought on the north shore of Lake Trasimene. Hannibal dispatched a small force to draw the Roman army into an ambush. The bulk of the Carthaginian army hid in the forest north of the lake and when the Romans arrived, Hannibal sprung his trap. The army rushed forth and pinned the Romans against the lake. It was a total victory for Carthage and put Rome back on its heels. In desperation the senate elected a dictator to conduct the war.